There were so many ppl (including myself) asking how to make that mysterious sidechain compression. So here are some tutorials i made or found in internet. Now lets see how to make this effect with different ways and programs. 1. Buy or download demo version of DB Audioware dynamics processor http://www.db-audioware.com/dB-D-dynamics-processor-more.htm. 3. Insert this VST on bass line and turn recv On. Now tweak it as you like. 1. Choose an instrument you want to use as sidechain "trigger" (the sound giving the compressor the command to jump in) a 4/4 kick for example and link it to an FX-channel. First of all you have to mute this FX -channel (do this by pulling down the volume fader, in the mixer, all the way). 2. Next you have to add a "fruity peak controller" to it... that's all you have to do to set up the "trigger". 3. Then link the sound you want to be sidechained to another FX- Channel and add the "fruity compressor (or any other compressor of your choice) to it, right click the "threshold" knob and select "Link to controller". You can only apply one device per "peak controller"
1. Create a Audio-Stereo-Group called "Sidechain". 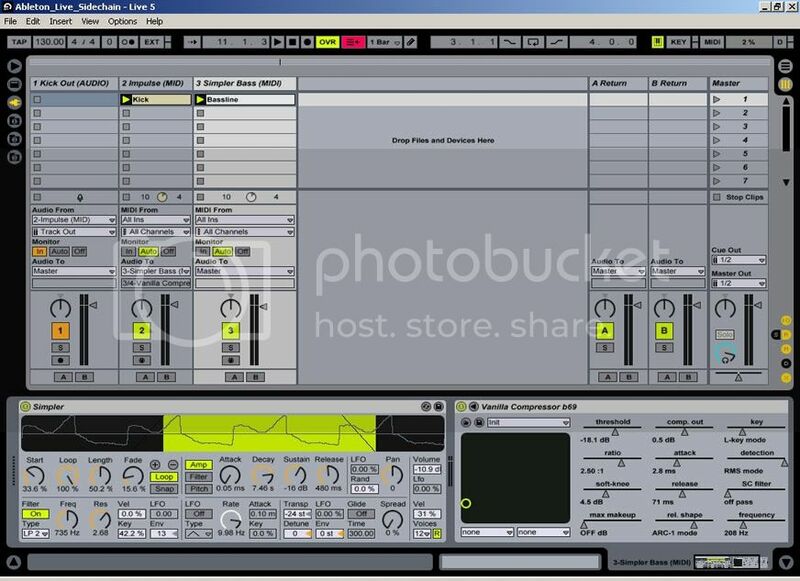 You see the plugin "Waves C1 Comp-sc" in the picture. Install this plugin in the Sidechain-Group. 2. Edit 2 kicks which play always at the same time. The picture shows the Midi-Notes of the duplicated kick. Just take your original kick (from your drumsampler for example), duplicate it and hit both Kicks always. 3. Root the 2 kicks into 2 different channels. Look at the picture. Rename one channel to "KICK" (the original one) and the other one you give the name "TRIGGER". You can also see that KICK is routet to the masterchannel of the Soundcard. TRIGGER is routet to a Group called "Sidechain". This is important, do it! Maybe you allready recognized that the channel TRIGGER is balanced hard to the left. Do it! You will see why. Only one of our two kicks is sent to the listeners ear. The other generates an internal signal for the sidechaing group. The TRIGGER-kick sends a signal which triggers the envelope and the dynamics. See the next pictures how it works. 4. Locate your bassline-channel. In my example its an audiochannel called "Bass". You just have to do 2 things: Send the Output to the Group "Sidechain"
And put the Panning to the hard right. There are 2 Signals now routing into the Sidechaining-Stereo-Group. On the left channel is our TRIGGER-Kick and on the right channel is the "Bass". 5. Open The Sidechaingroup. edit the plugin WAVES C1 comp-SC. Change the Key mode to L -> R, now the left input is the key for the right output. This means that the TRIGGER-kick which is sent on the left channel generates an envelope which manipulates a signal on the right channel (the "Bass"). We want to manipulate the bassline with the envelope of the TRIGGER-Kick. Edit smart hard parameters for Treshold, Ratio, Attack and Release. You will see that the visualation-diagramm shows a movement. The Y-Axis shows the volume-signal on the light side and the X-Axis shows the volume-signal on the right side. If you did all correctly.... enjoy! Make experiments, finetune the parameters. 1. First of all, create BASSLINE (in my case i used substractor) and make any melody you like. 4. We are done! Just play with compressor now (see tutorial file for parameters) and see the results by bypassing on/off. 2. Now load any kick sample on impulse and program simple 4x4. Then make any melody for bass. 5. So we have routed our Impulse on Vanilla compressor, while its working on Bass channel. We should only tweak our compressor now...as always for sidechain effect, use short attack and release with pretty low threshold. 6. If you cant hear your Impulse. Then use that audio channel we have created. On that channel select "Audio from" and select your Impulse channel. And finally press orange "In" button. Compression is just an automatic level changer after all! So if it can be done automatically, theres a way to do it manually. 1. Just Automate the volume of your BASSLINE corresponding to your kick. When your kick bangs the volume of your bassline must be low and increasing till new kick. Thats the princip. man! good stuff! think i've grasped the idea of SCC by now! Check if MUTE turned OFF. Sorry mate. Still don't get it. In your e.g what instrument is the "trigger"? U simply open a sampler? & I mean u "open a new ..." what? Thanks for making it sticky! Cool man! Really nice usefull topic here! Thanx!